Exceeding all expectations, the all-new 2016 Hyundai Tucson in Dallas is a premier crossover that maximizes space and utility in addition to efficiency and comfort. 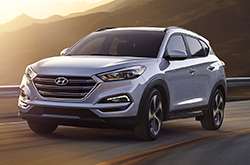 The perfect vehicle for families, commuters or drivers looking for extra cargo capability, the Tucson rolls into a new model year with a redesigned exterior, enhanced fuel economy ratings and an alluring interior package. Buyers of the new Hyundai Tucson will appreciate the redesigned shell marked by distinct creases, chrome exhaust tips, a rear spoiler and a bold hexagonal-shaped grille. With a wider wheel base and sleek curves, the Tucson exudes an aura of agility that is met by capable performance standards. Built for athleticism, the standard 2.0L, direct-injected four-cylinder offers an estimated 164 horsepower and 151 lb.-ft. of torque. For extra power and capability, our 2016 Hyundai Tucson review suggests the 1.6L turbocharged four-cylinder that is rated at 175 horsepower and 195 lb.-ft. of torque and offered in the Eco, Sport and Limited models. Need an efficient ride that can handle your daily commute? You'll be pleased to know that the 2.0L FWD model is estimated at 27/31 combined/highway mpg while the turbo engine is coupled to a seven-speed EcoShift dual-clutch transmission that offers a combined rating of 27 mpg in the Sport and Limited models and a combined fuel economy of 29 mpg with the Eco trim. 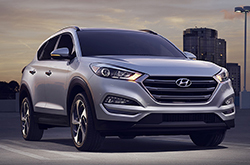 Distinguished by top-notch features, the 2016 Hyundai Tucson in Dallas introduces several compact CUV segment firsts like ventilated front seats and stain-resistant cloth seats as well as new features like an available smart power liftgate, dynamic bending headlights and optional heated rear seats. The 2016 Tucson also carries over entertainment and convenience features that will make your tech-savvy friends look twice. From the standard five-inch touchscreen display with a built-in rearview camera to the available Blue Link Telematics System and eight-inch screen with navigation, you'll always stay connected in your Tucson. Plus, safety always comes first thanks to premium standard air bags and an exceptional suite of safety technologies that includes lane departure warning, blind spot detection and rear parking sensors. 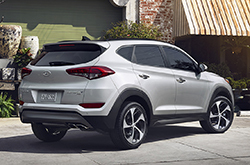 A family car with a twist, the all-new Hyundai Tucson offers a premier combination of practicality and sport that is unparalleled in rival crossovers. Want to learn even more? Check out the rest of our 2016 Hyundai Tucson review below or test drive one of our incredibly capable models near Dallas today! 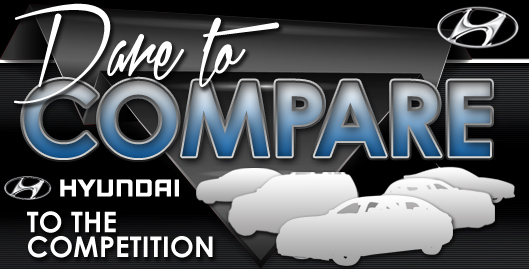 We challenge you to compare the latest Tucson model side-by-side with classmates like the 2016 Chevrolet Equinox, Toyota RAV4, Nissan Rogue and the Honda CR-V. That's how confident we are that it's right for you. Shoppers will be smitten with the Tucson's exquisite styling, as well as its handy cabin features. It's a fantastic value, which you'll definitely see when comparing its price to the vehicles in its segment. Find out more useful facts in our bullet list below this text! We've taken the time to create reviews about vehicles like the 2016 Hyundai Tucson because we know how important it is to your car search. As the well-known Hyundai franchise in Carrollton it is our responsibility to provide our customers with reviews created by the finest Hyundai writers around. Want to know about the 2016 Tucson's safety features and other specs? As your Hyundai franchise, you can count on us for dependable information. Want to read other Hyundai car comparisons and reviews? Then visit our digital research index page, where you'll learn about other new vehicles available at Van Hyundai.